My life isn’t a bowl of cherries, you know. Look at that snow outside the window. Pure misery. Then there are all these COMPLETE STRANGERS who come around and want my attention. This is my sister, Becky. Sometimes I have to peek into windows just to get some attention. There’s a rabbit. She’s on the PROPER side of this wall, and I’m sure all the good stuff is on that side. She gets to eat the fringe off that rug. The worst part is that she gets to invade my territory at night when I’m asleep. If she had some respect for my wallpaper, I would be happier. Plus, there’s something about her attitude I just don’t approve of. These jokers show proper respect. Even little Spike knows his place. Birds are okay with me. The Dude Ranch has moved out of my territory. I pretend they don’t exist and we’re pretty happy with the new arrangement. For a while I had to put up with baby birds. Baby birds grow up into chickens sometimes, and that’s what those did. We’re best friends, now. Sometimes I go into their yard, sometimes they come out into mine. Sometimes I have to sit by the gate to make sure they get to stay out and play with me. But then to thank me, they just steal my corn. This is one of my duck friends. He shows proper respect. These are more duck friends. They are so respectful it’s almost as if they’re afraid of me. The cat situation is getting out of control. Now there are two, but tomcats can’t reproduce so I’m not sure where they’re coming from. They’re fun to chase, though. Wiley Wabbit, the gray one, minds his own business, but Bonnie is very disrespectful. She gets up ONTO MY BED! Skippy and his freeloader friend Mr. Crow are only interested in peanuts. Like we are some major neighborhood charity organization. Then there is the occasional workman, but the usually end up being Visitors. It is an arduous journey to the front yard, where the grass is always greener. I have to beg to go out there. The front yard is not without its peril. In this photo I am scared to move because I am nearly crippled by my harness. You can see clearly that my leg is through THE WRONG HOLE. I was about to call 911 but then I decided to eat that corn, instead. Ah, yes. The photos. What is it with all the photography around here? Am I a supermodel? A rock star? An Olympic athlete? Possibly a stunt double for James Bond. I’m actually walking up stairs in this photo. BFD. And then there is the larger issue of my swimming pool. WHERE DID IT GO? I have to have my slave girl pour pitchers of warm water over me if I want a bath. It’s not an ideal situation. I only have three wading pools. I’m asking you- doesn’t it look like there is something missing here? Like maybe a SWIMMING POOL? No, this is NOT a swimming pool. It is a horse trough with fish in it. I present this photo as proof that they are torturing me here. Someone actually expected me to get in the pool to get that corn floating out there. FAT CHANCE OF THAT. Yes, this is the biggest insult of all. AND I’M NOT GOING IN THERE! Dobbye, you MUST get a nice, new, totally unbitable swimming pool!!! These baby-size pools are not for you! How can you practice your swimming skills in those dinky little pools? 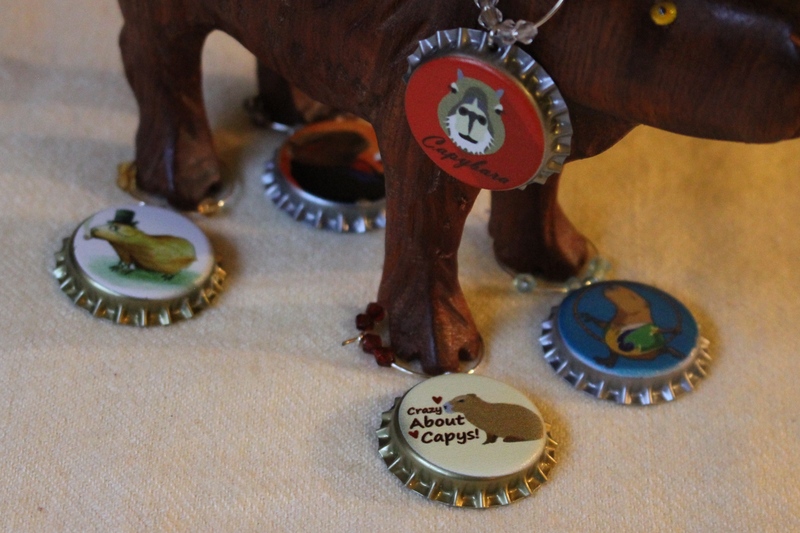 I suggest you call a Capybara Strike until the situation is remidied. Just a suggestion, mind you.